Apple Watch (previously rumored as iWatch) is the first Wearable Smartwatch developed by Apple and it’s powered by iOS 8 firmware's custom designed software framework to make it compatible with iPhone smartphone devices. 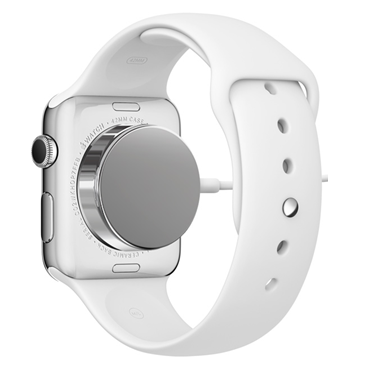 Apple Watch can be easily access by taps, buttons and voice commands. Today, we are writing a detailed Review of Apple Watch Features, Specifications, Models / Editions Type, Price, Availability and Compatibility details for wearable tech gadget lovers. Apple Watch is the most "comprehensive health and fitness device" as well the "most personal device we’ve ever created” says Apple. 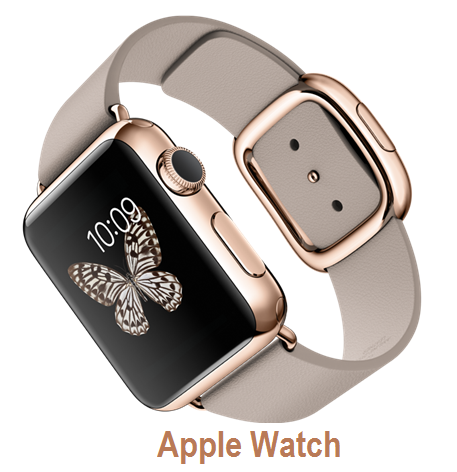 The display screen of Apple Watch is a flexible Retina Display with sapphire screen and it comes in two sizes i.e. 38mm and 42mm. Apple Watch is powered by four sensors i.e. Gyroscope, accelerometer, taptic engine and heart-rate sensor. Apple's first digital wearable Smartwatch uses MagSafe for charging battery with connector, so there’s no wireless charging option involved. Apple Watch is fully loaded with tons of applications such as; Emojis, phone dialing, voice navigation using Maps, email, Mobile payments using Apple Pay, Calendar, Passbook, controlling music, Apple TV, iTunes, Photos, Weather, Stocks, World Clock, Timer Stopwatch, Alarm, Remote Camera, Walkie-Talkie, and more. For Apple Watch Apps development, Apple has introduced a tool called "WatchKit". Apple Watch is available in two different wrist sizes i.e. 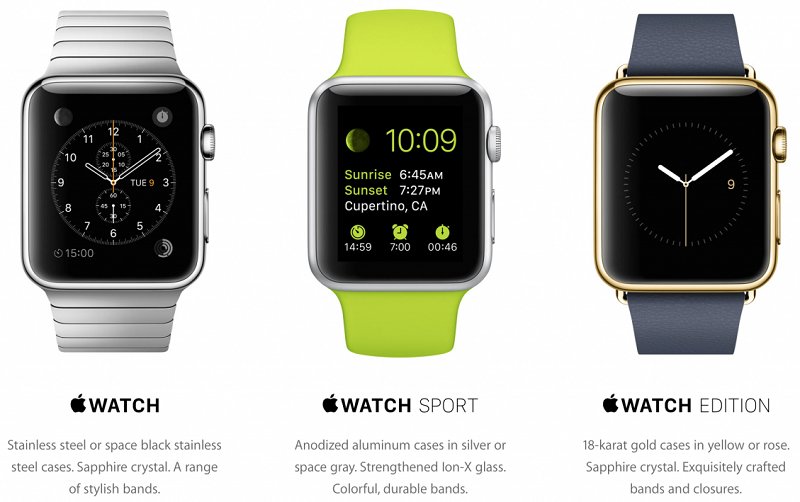 Apple Watch is available in three different editions with 34 different models i.e. All below mention models are available in two sizes. Customers can buy any of the below 22 or 34 different Apple Watch Models / Editions version type in two different sizes i.e. Apple Watch is compatible and supported by following iPhone smartphone devices. The official Pre-orders for Apple Watch will begin from April 10, 2015 and Apple Watch shipment will starts from April 24, 2015. How to Order Apple Watch? Customers can place Apple Watch Pre-order via online Apple Store. The official base price of Apple Watch will start at $349 for the entry level models. You can get Full Apple Watch Price List HERE.